This statue of a pikeman was sculpted by Albert Power. 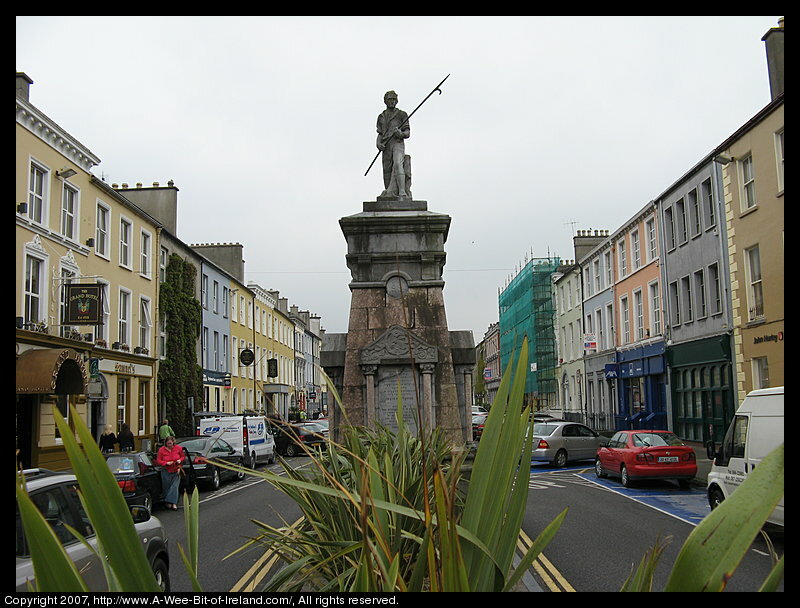 It stands in the middle of Denny street in Tralee (Trá Lí), the largest town in County Kerry. The statue is sometimes called "The Croppy Boy". This statue has been there since 1939 and replaces an earlier statue that was pulled down by the Black and Tans in 1922. The statue commemorates the Irish Rebellion of 1798 when Roman Catholics, Presbyterians, Methodists, other protestants united to seek democratic reforms and Catholic emancipation and independence from England. Theobald Wolfe Tone was a leader of the movement who traveled to America and France seeking help. The American revolt against English rule was an inspiration. More information about the Pikeman may be found at http://archiver.rootsweb.ancestry.com/th/read/IrelandGenWeb/2003-11/1068230067.